Since 1963, Kiptopeke State Park in Virginia has been the site of bird population studies. According to their website: Volunteers capture, examine, weigh, band and release resident and migratory birds each year from mid-August through November. In the raptor research area, hawks, kestrels, osprey and other birds of prey are observed and banded from September through November. Kiptopeke’s hawk observatory is among the top 15 nationwide. Famous for: That bird thing sounds pretty cool. Admission: There are numerous fees for camping, cabins, picnics and swimming. The rates vary greatly by season and can be found at the Virginia State Park website. Best hotel in the park: The park has a number of lodges that can cost over $200 per night. Best campground in the park: Stay in a Yurt! It is a modern adaptation of an ancient nomadic shelter, combining a beautiful wood frame and durable, electronically bonded architectural fabric. Functionally speaking, it’s a cross between a tent and a cabin. Best months to visit: October 7, 2010 through the 10th is their annual Eastern Shore Birding and Wildlife Festival. Admission is free. If you drive south from Olbia down the eastern coast of Sardinia, you’ll arrive at the popular seaside resort of Cala Gonone. Once a sleepy fishing port that was more accessible from the sea than the land, it’s now a popular holiday spot for Italians who drive over from the mainland as well as local Sardinians who swell the numbers in July and August as extended families gather for their summer break. Cala Gonone is the ideal spot for a family vacation if you want something to entertain everyone, with boat trips from the harbour, a couple of beaches within walking distance and a range of restaurants and small shops, as well as interesting excursions you can make by car and boat. For those on a budget, Camping Cala Gonone, set in the upper part of the resort is an excellent base, providing both camping pitches and small wooden cabins or static caravans that you can rent by the week. Because we flew to Sardinia, we preferred to hire a wooden cabin rather than bring all our camping gear, but we found the cabins fairly cramped at the size of an average family tent, although they benefited from a small shower room. This campsite didn’t appear to be suitable for larger mobile homes or caravans due to the limited space between the trees, but the camping was popular with couples, families and groups of friends. Camping Cala Gonone is a well-run family enterprise with a good range of sports facilities; a baseball court, tennis courts and a swimming pool that’s open in July and August. Despite the hot weather in summer, I was surprised when researching campsites in Sardinia, at how few coastal sites have a swimming pool, so this is a big bonus for families. There is a small shop, a restaurant where they serve pizzas fresh from the pizza oven and the campsite is only a short walk into the resort centre with bakeries, gelaterias and other food shops. 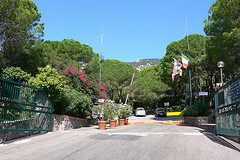 Camping Cala Gonone is set among pine woods providing very welcome shade from the heat of the summer although I’d avoid visiting the area from mid July through August as you”ll find the resort packed with Italian families on holiday. Better to go in spring and early summer or from September when the crowds have gone home and the weather is not so burning hot, or you’ll find it difficult to find any space for your towel on the beach. Camping Cala Gonone is a good coastal base for excursions and it’s popular to take a full or half day boat trip from the harbour, along the coast to see the Grotto di Bue Marina sea caves and the small beaches that you can only get to by boat, where you’ll be left for an hour or two to swim and snorkel before being picked up again. The Gulf of Orosei is also a popular diving spot where you can dive on wrecks and in sea caves – there’s a diving centre behind Camping Cala Gonone. If you drive up the hill from Cala Gonone there’s a small archaeological site of Nuraghe Mannu with a Nuraghic village that was inhabited between 1500 and 1000 years BC with a stone watch tower and a fantastic view over the bay. Through the tunnel carved through the rocky escarpment and you’ll find the unassuming hillside town of Dorgali, where you can also find accommodation if you prefer to get away from the busy coastal area. A short drive from here is the Gorge of Gola di Gorroppu where you can walk and climb in the gorge in spring and autumn, while in the summer when it’s too hot for walking you can find pools to swim in the river nearby. Camping Cala Gonone is a good coastal base for those touring eastern Sardinia to enjoy the beautiful Gulf of Orosei and some of the interesting sights nearby. One of the best road trips I have taken with my family has been to visit the Niagara Reservation State Park, upstate. The park opened in 1885, making it the state’s oldest park. Made up of over 400 acres of beautiful natural landscape, it also has great biking and hiking trails, wonderful lush picnic areas during the warm moths, and cross country skiing in the colder months. There are also spots to fish. 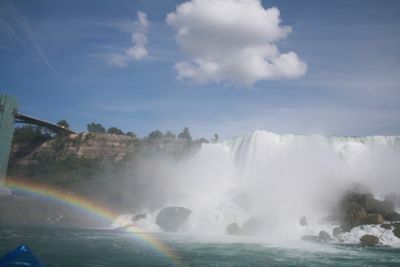 Most of all, it is best known for its most natural attraction of all: the Niagara Falls. Great Lakes Garden is the entry point of the park and has a visitor center which offers information and exhibits about the park, from its history to its geology. It is also where one can join tours groups on the Viewmobile, which offers three-mile guided tours, opportunities for photos stops at favorite scenic points, as well as access to the Schoellkopf Geological Museum. Another favorite stop for visitors is the Observation Tower which offers breath taking, clear views of the American Falls. The Falls have other wonderful amenities for travelers, such as hotels and restaurants. 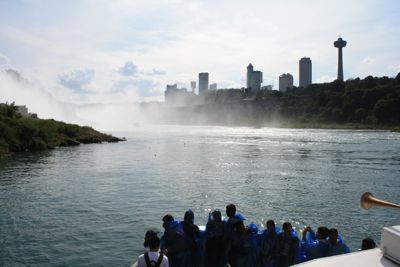 Attractions such as Cave of The Winds and Maid of The Mist are my family favorites, as well as the light displays seen from the falls at night. Visitors are able to purchase Niagara USA Discovery Passes. These provide significant savings and discounted access to attractions such as: Niagara: Legends of Adventure Theater, Aquarium of Niagara, The Gorge Trip, and Discovery Center. During the Summer, weekend and national holiday for the U.S. and Canada are celebrated with fireworks display above the Falls. Fireworks shows are every Friday and Sunday from mid-May through beginning of September at 10:00 p.m. Firework displays can also be seen on the following U.S. and Canadian holidays: Victoria Day, Memorial Day, Canada Day, Independence Day and Canadian Civic Holiday. Related: Gilbert Lake State Park, New York. Not too far from where we live, nestled between the neighborhood of Harlem and the Hudson River is Riverbank State Park. Underestimated by locals and mainly unknown to travelers, Riverbank is unique in the Western Hemisphere. Its urban rooftop design mimics the design of many other similar parks found throughout Japan and is built upon a sewage plant was built on top of a sewage treatment facility, which has been a topic of discontent to some. Nevertheless, this state-of-the-art park facility is the most heavily used in the city, offering many athletics, recreational, and arts amenities found on site. There are picnic areas ($30 per table rental fee) and two playgrounds for the little ones, as well as a carousel (50 cents per token). 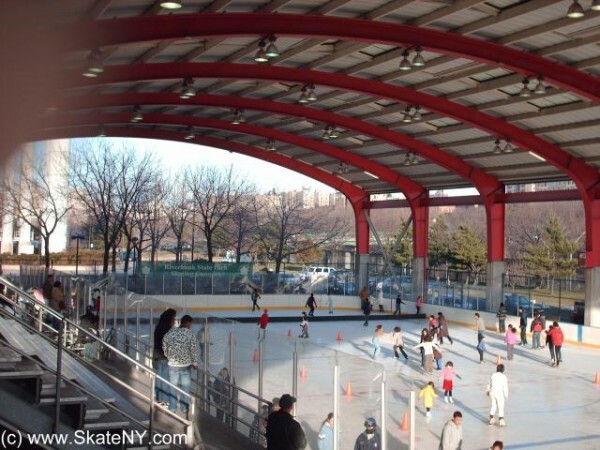 Swimmers and athletes have access to an Olympic-size pool ($2.00 per adult, $1.00 per child, $30 for monthly admission pass), a covered skating rink for roller skating ($1.50 admission, $6.00 skate rental) in the summer and ice-skating in the winter ($5.00 adults, $3.00 children), an 800-seat cultural theater, a 2,500-seat athletic complex with fitness room ($10 a day, $200 a year), and a 150-seat restaurant. Outdoor facilities include four basketball courts, as well as four tennis courts, a 25-yard lap pool, a wading pool, a softball field, hand/paddleball courts, and my absolute favorite, and something I have often used myself, a 400-meter eight-lane running track with a football/soccer field in the center. At water level with the Hudson River, one can enjoy the occasional performances held at the 400-seat amphitheater. 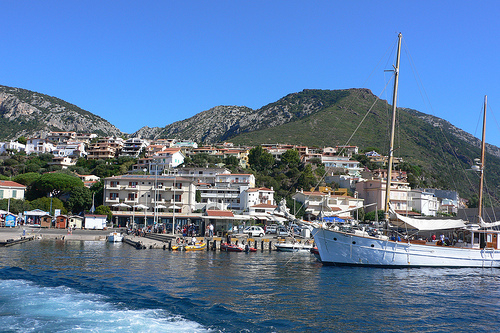 Fishing and sailing aficionados have access to docking facilities for boats. There are no pets or bicycles allowed. Riverbank also offers a summer camp program with activities such as swimming, skating, arts, crafts, tennis, track, weekly entertainment, field trips, and an end-of-program special show performed by all the campers. Kids ages seven to 14 attend weekdays from 8:30am to 5pm, from July 5 to August 17, at a cost of $500 per child with a $25 registration fee. Lunch is included. Registration forms are available at Riverbank’s main desk, Monday through Saturday from 9am to 5pm. Call 212.694.3633 for more information. Waubonsie State Park lies along the Missouri River on the western edge of Iowa within the area known as the Loess Hills. Though loess,a very fine sand particle left by the melting of glaciers 14,000 to 28,000 years ago, is found in small quantities around the world there are only two areas where you can find landforms of loess- along the Missouri River in Iowa and Missouri and in China. It creates a unique topography of steep and narrow ridge tops and its quick draining soil harbors plants like yucca, which are usually found in much more arid climes. The park was purchased in 1926 and named for Chief Waubonsie of the Native American Pottawattamie tribe. The park itself has changed little since its purchase, though the addition of the Wa-Shawtee Girl Scout Camp in 2005 added 642 acres and additional activities such as fishing, cabin accommodations, a youth group camp and a day-use rental lodge. With its scenic views this is a very popular park for a picnic. An open shelter is available to rent and many first-come sites are available. Forty campsites are available, 24 with electric hook ups. A modern shower and restrooms are on site. An equestrian campground is also available with 32 sites and non-modern facilities. 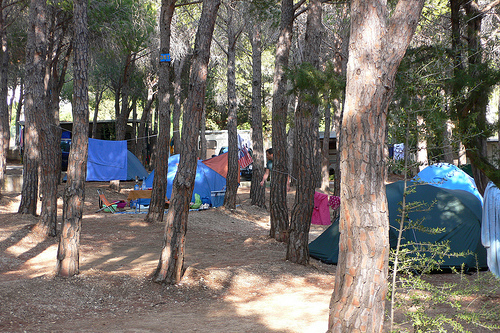 Half of the campsites are available for reservation, the other half are first come first served. Due to the popularity of this park I suggest making reservations in advance or arriving as early as Wednesday to snag a coveted weekend spot. Both hiking and equestrian trails offer incredible scenery. The Sunset Ridge Interpretive Trail provides visitors a chance to learn about many of the park’s plants and trees. Waubonsie State Park is also a part of the national Lewis and Clark Historical Trail. If you don’t feel like “roughing it” there are quite a few cabin options, available through the park reservation system. Varying in size from studio to three bedroom all have kitchens, bathrooms, heat, air conditioning and a stone fireplace. Prices vary depending on the cabin; some cabins may only be available by the week during peak season. Seven acre Lake Virginia offers a chance for canoeing or kayaking as well as a chance to cast your line; the lake is well stocked with channel catfish, largemouth bass, and bluegill. to enjoy its wonders during the summer. Though Montauk State Park has the normal outdoor activities like hiking and boating to offer visitors, the real lure of the park is the fishing. Trout fishing to be exact. 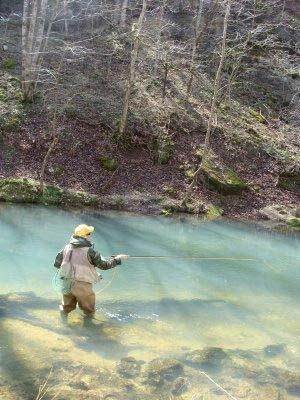 This is because the park is located in southcentral Missouri at the headwaters of the Current River, which combines with the smaller Pigeon Creek to provide the ideal home for rainbow and brown trout. Anglers descend on Montauk State Park from March 1 to Oct. 31 for the official trout season, and on winter weekends for a catch-and-release season. Famous for: Did I mention the trout fishing? That’s the #1 draw for this park year-round. Families with children will like: Um…fishing? They’ll also enjoy a visit to the park’s trout hatchery to see how the whole process of stocking the river works. Other travelers will like: Situated in the Ozarks, there’s plenty of natural beauty to explore via hiking. For those not into trout, the park was also home to an early settlement of western pioneers and there are guided tours of the still standing 100-plus year old grist mill to undertake. Camping information: The park has several campsites ranging from basic tent-only to those that offer RV sites with electric hookups. Rates range from $13/night for tent-only primitive sites to $26/night for full electric/water/sewer hookups. Other park lodging: Inside the park, guests can also stay at the Montauk Resort, which offers both motel-style rooms and cabins for rent. Free Wifi is available for guests of the resort, in addition to the usual amenities. 2010 rates are from $61 to $73/night in the motel portion, and from $61 to $152/night for the cabins. Other nearby lodging: The town of Salem, Missouri (10 miles northeast), has several motels/hotels. Best months to visit for weather: Late spring and early fall are best for moderate temperatures. Best months to visit to avoid crowds: Peak tourist seasons are the summer months and holiday weekends. Spring and fall weekdays are probably the best if looking to avoid crowds. Those who love the fresh air of the outdoors in Missouri flock to Meramec State Park to enjoy the Meramec River as it flows through the Ozarks. From fishing and boating to rock climbing and hiking, nature lovers have plenty to do. Those who like their vacations in cold, dark and wet places also come to Meramec State Park. This is because the park is home to a system of caves, just ripe for exploration. Many of them are in remote areas of the park, but Fisher Cave offers naturalist-led tours on a daily basis from spring through fall. This is truly a park that offers something for everybody. 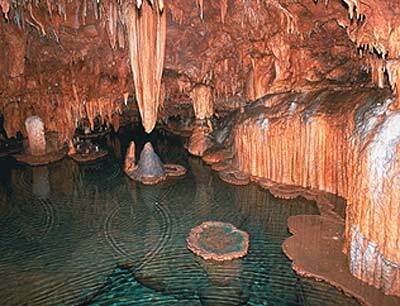 Famous for: Tbe park has over 40 naturally created caves to explore, including the popular Fisher Cave. Families with children will like: Tours of Fisher Cave, which are available on a daily basis from April 16 until October 15. Visitors can view well-preserved bear claw marks, cave wildlife and a vast array of calcite deposits ranging from intricate hellectites to massive columns 30 feet tall. 2010 fees are $8/adult; free for children 5 and under. Other travelers will like: Fishing (license required) for catfish and bass. The park also has more than 10 miles of hiking trails. Easy sightseeing: One of the best ways to explore the park is to rent a canoe and do a lazy float down the river. Those who don’t want to take to the water can still learn about the Meramec River with an extensive exhibit of the park at the visitor center. Camping information: There are several campsites ranging from basic tent-only to those that offer RV sites with electric hookups. Rates range from $13/night for tent-only primitive sites to $26/night for electric/water/sewer hookups. Other park lodging: The campgrounds also offer several cabins for rent, from a 1-bedroom that sleeps four to a 5-bedroom that sleeps 10. Rates range from $90/night to $220/night, with a two-night minimum. Each cabin comes equipped with pots, pans, dishes, coffee pot, toaster, towels and linens, air conditioning and heat, full size beds, refrigerator, either a stove top or full stove, and most have a microwave and fireplaces. There are no televisions, telephones or clocks. Inside the park, guests can also stay at the Hickory Ridge Motel and Conference Center. Rates are $60/night for 2 queen bed rooms and $90/night for three queen beds and a loft rooms. Rates are for 2010 double occupancy; additional guests are $10/person. Other nearby lodging: The town of Sullivan, Missouri, has a wide variety of lodging available. Best months to visit to avoid crowds: Peak tourist seasons are the summer months. Spring and fall weekdays are probably the best if looking to avoid crowds. Intro: Denali State Park is really, really big — at 325,240 acres, it’s half the size of Rhode Island! The park was established in 1970, and expanded in 1976. On the western side it shares a boundary with the similarly named, but much more developed, Denali National Park and Preserve, formerly Mt. McKinley National Park. Famous for: Denali is the original name for Mt. McKinley. At 20,320 feet, Mt. 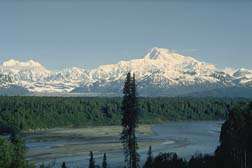 McKinley is North America’s highest peak. It literally and figuratively towers over South central Alaska from its base in Denali National Park. Admission: Denali is such a huge park that there are a variety of day, season and annual pass options. See the Alaska State Park Fees page for information about the specific activity you have planned. Families with young kids will like: seeing so many wild animals, even from your car. Families with teenagers will like: Getting out and getting active in the great outdoors. There’s something for everyone, from hunting and fishing, to photography, animal watching, hiking, cycling, dog sledding, boating, canoeing, rafting & kayaking,…if you can do it in a flannel shirt and a pair of hiking boots, you can do it in Denali. Other travelers will like: “Flight seeing” — a popular way to see the icy expanses of Alaska is from the windows of a small plane or helicopter. See bears from a safe distance! Easy site seeing: This is pretty rugged country, but it’s easiest to do a drive up George Parks Highway, the major road link between Anchorage and Fairbanks, that divides the park. Best hotel in the park: Has yet to be built, but a visitor center is in the works for the southern part of park. Best campground in the park: The park operates three campgrounds, four viewpoints and five trailheads. The park also offers three public use cabins available for rent on Byers Lake. But if you’ve gone all the way to Alaska, you should really go all the way and do some backcountry camping, which is allowed any anywhere along the ridge trail. Just remember to camp away from the trail, avoid spots where others have camped, and bring a stove, because campfires are not permitted on Kesugi Ridge. Worst lodging experience: Just be careful of bears! Use bear proof containers for your food, and read up on Safety Tips! Best months to visit for weather: June through early September, but you can catch some pretty cold, wet weather at higher elevations. Be prepared, this isn’t a trip to the beach! Best months to visit to avoid crowds: The nice thing about a park the size of Denali is that crowds aren’t really a factor. That said, the peak months of June through September will also be the most visited times. For a true adventure, check out the park in the winter! Nearest major cities: 130 miles north of Anchorage by car, about 100 air miles north of Anchorage, Alaska. I typically don’t think about Earth Day. It’s not because I don’t care about being “eco-friendly”, but I just don’t really remember it’s Earth Day until it’s over. I honestly don’t typically think about observances and holidays in which I’m not receiving something, which basically excludes every holiday but Christmas and my birthday. However, this year I’ve seen much more press and information about Earth Day, such as events and new initiatives. The travel industry is even getting in on Earth Day and one such campground in Myrtle Beach is prepping for the day by launching a green initiative that few resorts are doing. Ocean Lakes Campground in Myrtle Beach is raising awareness and expanding their environmental efforts by partnering with their local recycling facility. Campgrounds are often a hot bed of trash and waste, as campers rarely appropriately dispose of their trash. Lakes, bathrooms and campsites are often where camper’s trash gets dispersed. Myrtle Beach’s Ocean Lakes Campground is setting a precedent by hauling their own recyclables to the recycling facility. The Myrtle Beach campground has five rear loaders and is now dedicating one solely to appropriately recycling. Since the beginning of the year, the campground in Myrtle Beach has hauled nearly 10 tons of recyclable products. Ocean Lakes Campground in Myrtle Beach hopes to lead the way in more campgrounds, hotels and resorts increasing their green initiatives. The campground is the first in the area to start hauling their own recyclables. 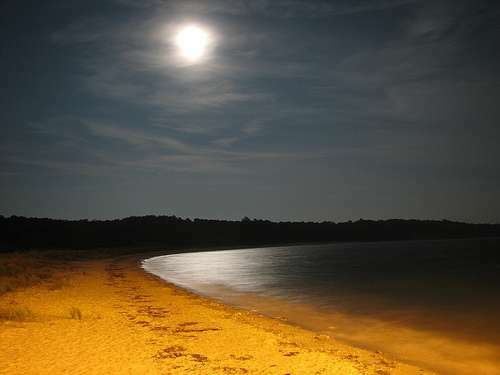 The campground is nationally acclaimed and the largest campground on the East Coast. The campground is one of the few oceanfront campgrounds available in the south and features over 3,000 campsites. 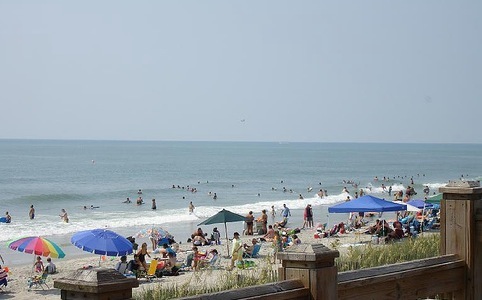 Ocean Lakes is a resort in and of itself, with amenities that includes a large outdoor swimming pool, playgrounds, bike rentals, nature center and recreation center. Rates typically being at $28 nightly. If you aren’t the rustic type, the Myrtle Beach campground also offers a variety of beach house rentals. Photo from sshep on Flickr. Intro: One of the most famous parts of 1-93 is the eight mile stretch that winds between the Kinsman and Franconia mountain ranges, and through Franconia Notch State Park. Franconia Notch is home of the famous Old Man of the Mountain, which could be seen from two spots on the highway until it crumbled after nearly two centuries. The park is filled with easy to get to, family friendly activities, like the Flume Gorge Visitor Center, the aerial tramway at Cannon Mountain, and the New England Ski Museum. You can swim at Echo Lake, fish at Profile Lake, bike on the Recreational Trail, go rock climbing, see wildlife or hike on the Appalachian Trail. Famous for: Old Man of the Mountain, gone now, but you can still see cool pix, and where it used to be. This striking profile was discovered in 1805, and made famous as “Great Stone Face” by notables like Nathaniel Hawthorne and Daniel Webster. Natural erosion finally took their toll when the profile collapsed on May 3, 2003. Take the 8 minute tram ride to the 4,180′ summit of Cannon Mountain and see the mountains of four states plus Canada on a clear day. At the top you can walk around, hang out on the observation deck or in the cafeteria. Bonus: restrooms. 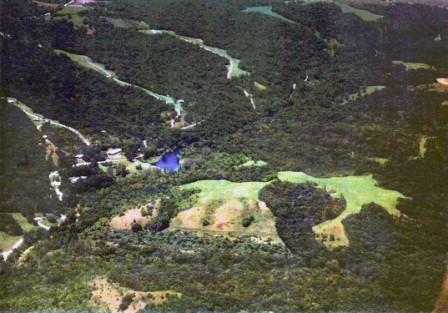 The dramatic natural gorge was discovered in 1808, and extends 800 feet from the base of Mount Liberty. You can walk through the Gorge, or see the whole area on a two mile loop hike, which includes lots of up hill and stairs. You can also get out of the summer heat and watch a 20-minute movie about the park. It’s a bit of a gory tale, but travelers who enjoy oddities or the travel essays of Sarah Vowell will probably be fascinated by the story of Thomas Boise survived the night by wrapping himself in his horse’s body. One night in the early 1800s, Thomas Boise got stuck in a blizzard. He killed his horse, skinned it, and wrapped himself in it, and spent the night under a rock. Rescuers had to cut him out of the frozen hide, still living but in need of a new horse. If that story doesn’t put you off your lunch, there are some lovely picnic tables and a great view right by the chunk of granite that sheltered Thomas Boise. Drive up to the lake, hang out at the beach, with life guards on duty, and enjoy a quick lunch from the snack bar. Perfect summer afternoon! Okay, it’s more of a cabin than a hotel, and you have to hike in with your own sleeping bag. But it’s an easy 1.75 mile hike, great for kids, and it’s open year round. You can even ski in during the winter! Centrally located, Lafayette Place can be your base of operations for every kind of park activity, from hiking, to biking, fishing, swimming, plus all of the nearby attractions of the White Mountains. You’ll find shaded spots, with open fireplaces, parking — and of course a picnic table at each of the 88 “by reservation” campsites, plus seven first-come/first-served spots. Bonus: coin-operated showers and a camp store. Open from Memorial Day weekend through Columbus Day weekend, with self-service/self-pay camping available during the off season, weather permitting. Worst lodging experience: Getting caught in a thunder and lightening storm while camping in the mountains. Pack rain gear, even if you don’t think you need it. Best months to visit for weather: It’s a year round park, with summer and winter sports, gorgeous fall foliage, and plenty of stunning waterfalls that will awe you during the spring melt. Best months to visit to avoid crowds: It’s always pretty crowded, the shoulder seasons will have slightly fewer people, but also worse weather. More info can be found at the always helpful New Hampshire State Park site.